Safeguarding our beneficiaries’ personal information continues to be one of our top priorities,” said CMS Administrator Seema Verma, in a statement issued on January 16, 2019. “The Trump Administration is committed to modernizing Medicare and has expedited this process to ensure the protection of Medicare beneficiaries and taxpayer dollars from the potential for fraud and abuse due to personal information that existed on the old cards. All beneficiaries should continue to use these new cards as a valuable resource when seeking care. These new cards will not only be easier for beneficiaries, but also provide the Medicare program with essential protections due to the new unique identifier on the cards,” said Verma. 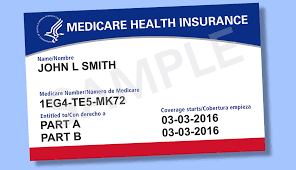 Last April, CMS began mailing the new Medicare cards, each of which features a unique, randomly assigned Medicare number known as a Medicare Beneficiary Identifier (MBI). The MBI is a combination of letters and numbers that helps prorect against personal identify theft and fraud. CMS mailed the newly designed cards on a rolling schedule to every Medicare beneficiary, completing the task three months before the April 2019 deadline for replacing old Medicare cards set by Congress as part of the legislation passed under the Medicare Access and CHIP Reauthorization Act (MACRA) of 2015. Medicare patients are now using their new cards in doctor’s offices and other healthcare facilities. More than half of healthcare claims CMS is processing now include the new MBI, demonstrating a smooth transition to the new cards use. Healthcare providers submitted 58 percent of all Medicare fee-for-service (FFS) claims with an MBI for the week ending January 11th. If You Never Received Your New Medicare Card…. For those Medicare beneficiaries who have not received a new card by now, CMS suggests making a call to 1-800-MEDICARE for assistance. They will verify your identity, check your address on record, and help you get your new card. Or log into your MyMedicare.gov account to get your new Medicare number or print your official card. The new Medicare number is now available in your account, even if you didn’t receive your new card in the mail. Accounts are password-protected and secure. To access or create an account, by visiting MyMedicare.gov. You can also ask your health care provider to look up your new Medicare number through a secure portal when you come for a medical appointment. Although the new Medicare cards are designed to protect against identity theft, Medicare beneficiaries should continue to be extra vigilant against scams. CMS recommends that you destroy your old Medicare card so no one can easily get your personal information. Start using your new Medicare card immediately. The newly issued card does not impact or change your healthcare benefits. If you’re a Medicare Advantage Plan (like an HMO or PPO) or a Medicare Drug Plan, keep using that plan Identification card whenever you need care or prescriptions. However, please carry and protect your new Medicare card too — you may be asked to show it. Finally, only give the new Medicare number to physicians, pharmacists, other healthcare providers, insurers, or people you trust to work with Medicare on your behalf. Medicare will never call uninvited and request your Medicare number or other personal information.